Keloids are a common problem. They are common in the Black and Asian patient population. The cause is genetic. Almost everyone who gets keloids can identify a family member with the same problem. Keloids have a varied appearance. Usually keloids appear as a hard and painful growth that itches. They will usually enlarge, sometimes very quickly for no reason at all. Keloids can progress to go well beyond the original site where the problem started. Keloids can invade and disfigure or destroy the area that is affected. 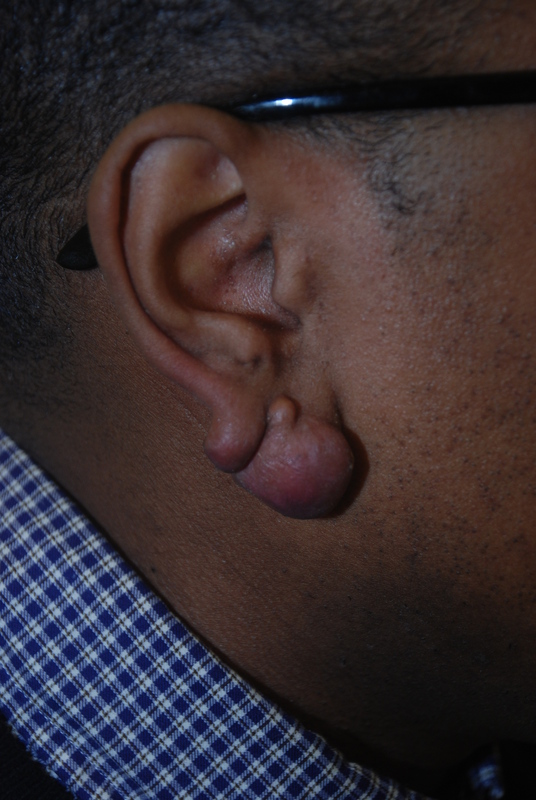 Keloids can be difficult to differentiate from a hypertrophic scar on examination. The diagnosis is accurate with pathological sample or excision. Keloids are difficult to live with and can also be difficult to treat. Keloids can grow from the most innocuous of skin injuries like a scratch. Typically, they occur after cuts, surgery, trauma and infected cysts. They will typically have a period of rapid growth which will then slow down. The treatment for keloids is usually combination type of treatment. If the keloid is very small and amenable to injection, then steroid injections are the first line of therapy. However, these areas have to be small and the steroid has to be injected into the keloid for it to be effective. This usually has to be repeated in 3-6 week intervals until there is a regression in the size. Very large keloids or very bulky keloids will need to be reduced in size or excised primarily followed by the steroid injection. The volume reduction can be performed with nonsurgical means including lasers, cryotherapy (freezing) or surgical excision. This is then followed with the steroid injections. The final line of therapy for patients who have recurrence after the steroid injections and the surgical reduction is a re-excision followed by low dose radiation therapy. The problem with the low dose radiation is that not all areas of the body can be subjected to this low dose radiation. The neck, breasts and lower abdomen are no good areas for radiation because the low dose radiation carries a risk of inducing cancer in the glands located in these areas.